Charlize Wynwood and Silas Nash have been best friends since they could walk. They've been in love since the age of fourteen. But as of this morning...they are complete strangers. Their first kiss, their first fight, the moment they fell in love...every memory has vanished. "I don't care what our real first kiss was," he says. "That's the one I want to remember." Charlize and Silas must work together to uncover the truth about what happened to them and why. But the more they learn about the couple they used to be...the more they question why they were ever together, to begin with. This is so much better when you have all three books in one. No stopping…just reading straight through. I read the first book in this series a while ago. I liked it…but it was just too unfinished to get high enough rating from me. 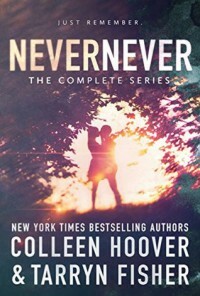 Never Never is a teen love story with a forever kind of feel. I inevitably felt like I could have done without the blatant promiscuity between Charlie and Silas but their love story is super sweet, so I'll try to let it slide. If you are turned off by stories that have a splash of paranormal then this might not work for you. I myself, really enjoy stories like this, though. Maybe, even more than full-blown paranormal…I just feel like I connect when it's more subtly done. Book Cover~ Love the new cover for the combined books in the series.